Just because we missed out on all things Lost at this year’s San Diego Comic-Con—Carlton Cuse and Damon Lindelof at a showrunner’s discussion; getting tested at the (new) Dharma Initiative recruiting booth; and the big Lost panel in Hall H (capacity 6,500)—doesn’t mean Max Pictures has given up on Lost until Season 5 begins next February (*sob*). Oh no, we’re just going to bide our time watching Seasons 1 through 3 on DVD (and Season 4 on ABC.com) and obsessively checking Lostpedia and DharmaWantsYou for updates on the Lost alternate reality game. 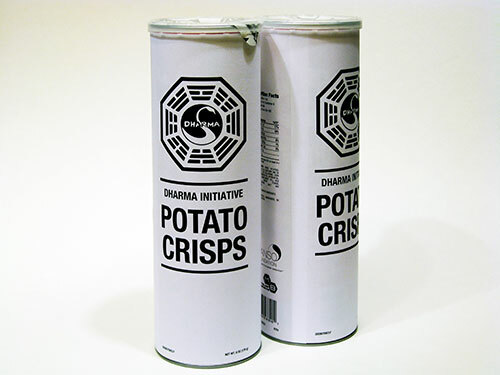 And, while we’re scouring the Web and watching our DVDs, we’ll be enjoying our light and tasty DHARMA Initiative Potato Crisps. Print out the label on an 11×17-inch sheet of paper and wrap it around your favorite brand of canned potato crisps. This entry was posted on Thursday, August 7th, 2008 at 4:30 am	and is filed under Film/Video, Food, Graphic Design. You can follow any responses to this entry through the RSS 2.0 feed. Responses are currently closed, but you can trackback from your own site.